Fairview Valley Community H.S. "Foxes"
Fairview (population 493) is located in upper-western Illinois in northeastern Fulton County. This places Fairview about 30 miles east of Peoria and about 30 miles northeast of Macomb. Illinois Route 97 is the main roadway in and out of Fairview. County Highway 17 crosses Route 97 in town as well. The Little Coal Creek flows through the northwest side of Fairview. The town was platted in 1837. A school was established in Fairview in 1839. A school named the Fairview Academy was established in 1863. 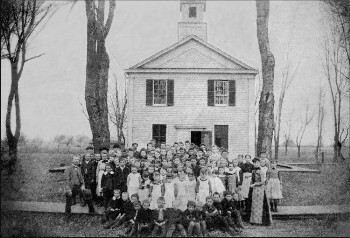 High school curriculum for the Fairview students was in place by 1897. In 1899 it was decided to build a new school building in town which was completed in 1900. Fairview High's first graduating class was the class of 1900. This was from a three-year high school however. 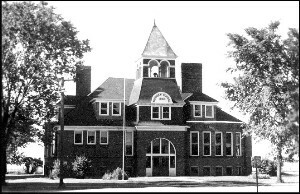 In 1908 Fairview High began offering a four-year high school education. 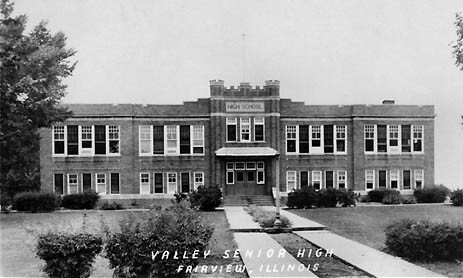 Fairview High School served the town on a solo basis through the late 1940s. It was then that consolidation talks between the neighboring towns of London Mills, Maquon, Fairview and Ellisville took place. After the completion of the 1948 school year these talks became a reality with th e creation of the Spoon River School District. "This is an article from the first year book from the Fair-View school in 1925." "A QUARTER OF A CENTURY OF PROGRESS"
"The Fairview High School was organized as a three year school in 1899 thru the efforts of Mr. E. H. Murphy and the county superintendent. The first class of four graduated in 1900. In 1908 it was changed to a four year school, the subjects being alternated so that one teacher was all that was required. When the enrollment reached 33 in in 1917 another teacher was added to the force and the school received probationary recognition with the State Department. In 1919, the third teacher was added and all sixteen subjects were given each year, which marked a decided advance over the alternate system. In the spring of 1920 Principal Wm.C. Wilson obtained statistics concerning the fall enrollment and learned that it would be impossible, without alteration of the building then occupied, to care for the puplils. He presented the matter of the organization of a Community High School District to the directors,A.C. Wilson,C. S. Voorees and J.C. McCombs, who immediately started to work. Everyone rallied to the program for a better school and in a special election Dr. W. L. Crouch, Jermone Lawson, Guy Alcot, Chas. Otto, and Marion Hart were made members of the Board of Education. In the fall of that year 12.8 acres of land was purchased from Mr. Wm. Polhemus. Progress was being made at the old building, for at that time the State gave us Regular Recognition as a four year High School, which meant that our work was equal to that of other Schools in the State. The Registration of students in the fall of '21 showed such an increase in numbers that four teachers were hired. This fall also marked the beginning of the construction of the new building. The Directors served the people faithfully,arranging for the erection of our modern building, and during the erection,gave many days of labor amd much time in overseeing the work. They derserve much credit for our having such a well constructed building. They kept the confidence of a UNITED COMMUNITY in the spending of the $100,000.00 which was so loyally voted, and placed at their disposal. On February 22, 1922 we were recognized by the University of Illinois, which meant that our work would be accepted at face value in our University or in any college. During that spring, Mr. Hart was succeeded by Mr. Will Cattron, who still serves with the other original members of the Board. Five teachers greeted nearly one hundred pupils in the new home on the opening day in September 1922. That was a glorious day for Fairview. Our goal then became the being recognized by the highest accrediting body supervising the work of High Schools. The North Central Association of Colleges and High Schools. Blanks containing questions concerning the school work, community spirit, equipment and community were filled and sent before this body of men representing nineteen states. On March 28th, 1925 we received official notification, and congratulations from H.A. Hollister, the chairman of the state committee, and on the next day futher congratulations came from the Treasurer of the Association, "On maintaining Educational Standards which will admit you to this select list of schools." Now that our school has attained the highest possible recognition, parents, pupils and teachers must continue to co-operate to keep it on this high level." The Fairview High School building served as the Spoon River Valley High School building for several years. This is why it appears as Valley High School in the photo at the top of this page. A new school building was completed at Routes 97 and 116 near London Mills in 1973, rendering the Fairview school building without a scholastic use. The Fairview school building has been razed. .
Fairview HS team nickname: the "Foxes"
School Fight Song: Valley High! Fairview High School had some real nice basketball teams in the 1930s and 1940s We believe track and baseball teams were also fielded. If you have any information you can share regarding Fairview High School's athletic history please contact us via e-mail. The Fairview High team of the late 1930s and 1940s had some great success. A total of five District titles were won by the FHS boys during this time period (www.ihsa.org). Unfortunately this is the only information we have available. Team records, coach's names, and conference affiliation are all being sought. We are told by Robert Abbot, who was a Freshman in 1941 at Fairview High School, that the Foxes competed in 6-man football that year against other schools in the area. Due to the start of World War II and the limitations put on travel and such, the program was stopped after that season. "Although Fairview, Ellisville, London Mills and Maquon high schools consolidated in the late 1940s to form Spoon River Valley Unit District (Valley High School), I coached football at Valley HS and basketball at Fairview Grade School, where I had the chance to see (but, unfortunately, never photographed) several gyms which would have been a perfect fit for the movie "Hoosiers". 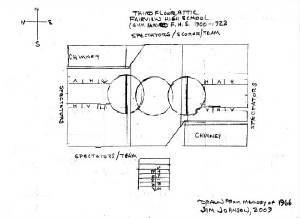 Floating center (10 second) lines at the schools that were once high schools(Maquon, London Mills, Ellisville, and Fairview), the latter of which had only balcony seating, surrounding the playing surface below on three sides. But it was the old 1900-built Fairview school building - the second Fairview High School building, by then a grade school - that had the most unique basketball floor I have ever seen. The school had a high-pitched roof, allowing plenty of roomfor shots at the 10' baskets at end of the facility, and had a floating center line near each free-throw line. Using the standard "key-hole" 12' circle and 6' lane, (with an offensive and defensive player designation at each of the three positions along the lane), which the post player -- or anyone for that matter -- could stand all day if he so desired, since the 3-second rule was decades in the future. But, since the school used forced-air heat, it was equipped with two huge chimney shafts, basement to roof, the floor had to be designed to accommodate them. Thus, the floor was, in effect, a hexagon, and the offensive players could virtually use the chimney's to set a pick on a defensive player. I was told that, oddly shaped as it was, the floor was even used to host the Fulton County Tournament." "First let me congratulate you for the job you have done. It is really nice to see that someone cares about the small schools. My senior year (Class of 1945) the enrollment at Fairview High School was 98 and our class graduated 13."